Do you love crochet dishcloths as much as I do? Not only are they an excellent handmade gift, they are also a great way to learn new stitches! 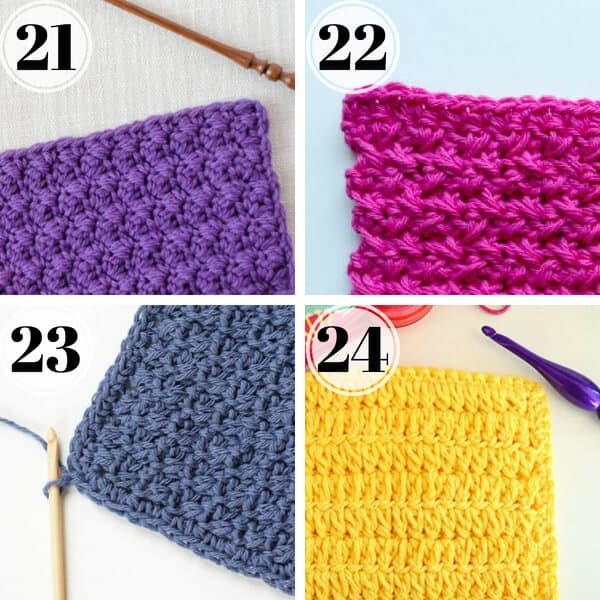 I’ve rounded up over 27 of the best crochet stitches for dishcloths for you! 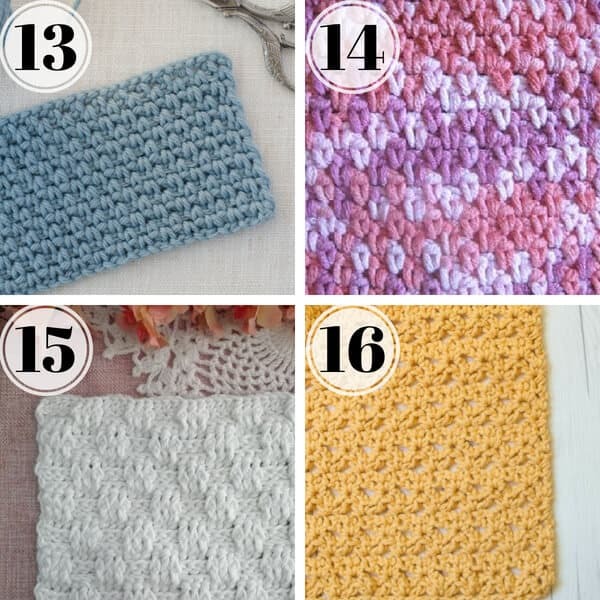 Most of the stitch tutorials either include a pattern for a dishcloth or washcloth or they have a link to a pattern. If you want to venture out on your own or change the sizes, follow the starting chain instructions (ex. chain an even number) and chain to your desired length. 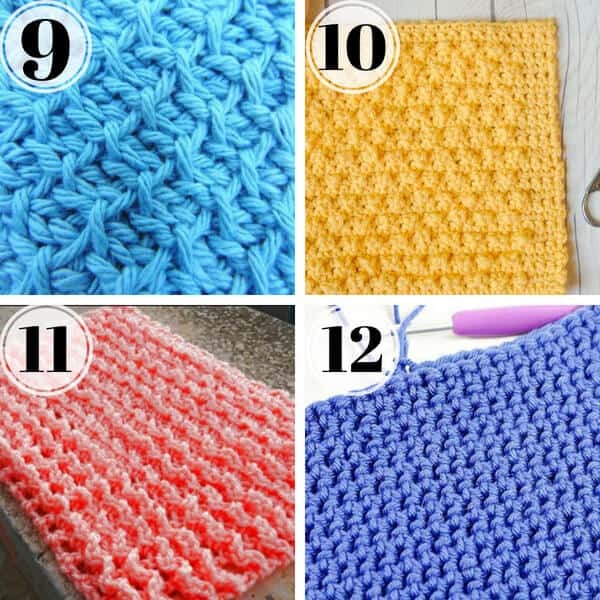 The average size for a dishcloth is around 8″ by 8″ but you can make them any size you want! 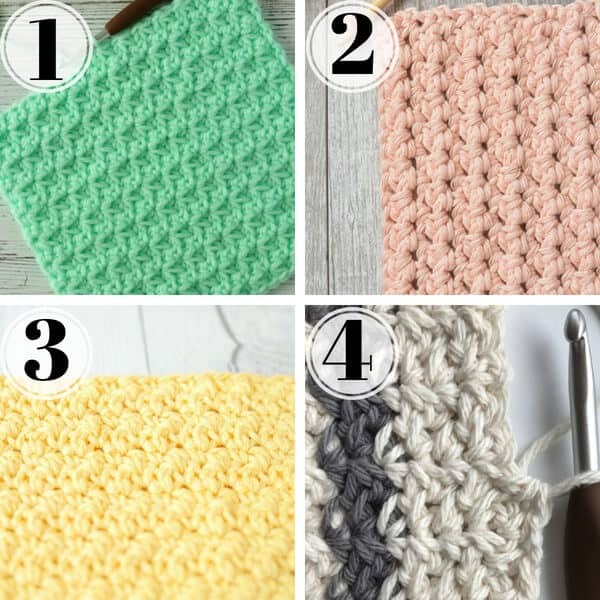 Before you dive in, it would be a great idea to head to Pinterest and create a “Crochet Stitches” board if you don’t already have one. (You can see my Crochet Stitches board here.) Save this post so you can easily reference it when you are looking for new stitches. Each one of these bloggers I’ve linked to also has a way to save their posts to Pinterest. Look for a “Pinterest” button or a “P” button at the top or bottom of the post. Sometimes you can even hover over the image and a “save it” or “pin it” button will pop up. There is one instance where the same stitch is shared – the Moss stitch / Linen stitch / Granite Stitch / Seed stitch / Woven Stitch – SO MANY NAMES for the same stitch! While the stitch is the same, the way each designer uses it in the related pattern is different! The Seed Stitch linked in #7 is a TOTALLY different stitch than the (sc, ch 1, sk 1, sc) stitch with a bazillion different names. (Let’s just make a decision, people, and stick with it, ok?) Really though, whatever the stitches are called, they are fun and beautiful and I am so thankful that the internet has provided so many opportunities to find and learn new crochet stitches! The Trinity Stitch by the Unraveled Mitten. There isn’t a pattern for this one but a starting stitch count provided should make a good sized dishcloth. The Single Crochet Cluster Stitch by Mama in a Stitch. There is a washcloth pattern included in the post. The Lemon Peel Stitch by Salty Pearl Crochet featured on the Unraveled Mitten. There is a dishcloth pattern included with the stitch instructions. Crossed Half Double Crochet by Oombawka Design. This fun stitch includes a dishcloth pattern and I love the red, white and blue theme! Pebble Stitch by Oombawka Design. The pebble stitch instructions include a dishcloth pattern but how cozy would a blanket in this crochet stitch be? Seed Stitch by The Stitchin’ Mommy. This includes a dishcloth pattern. Remember that this seed stitch isn’t the same as the granite/linen/woven stitch. Tunisian Honeycomb Stitch by CrochetKim. What good would a round up be if it didn’t include a beautiful Tunisian stitch? There is a link to the Tunisian dishcloth pattern in the post. Berry Stitch by Salty Pearl Crochet. There is a washcloth pattern included. Picots in a Row by Meladora’s Creations. This one shows the starting stitch count so you can make your own size. I am loving the texture! Thermal Stitch by Nicki’s Homemade Crafts. While there isn’t a dishcloth pattern, there is a link to a potholder pattern. The size is similar to a dishcloth and would make a great, thick scrubbing cloth. Linen Stitch by Crochet 365 Knit Too. The tutorial links to the seed stitch dishcloth which is worked diagonally and looks so much like your favorite knitted dishcloth. Moss Stitch by Meladora’s Creations. This post includes a wash rag pattern and is the same stitch as #13 but works it in normal rows. Crochet Basketweave Stitch – Crochet for You. Even more great texture in this basketweave stitch which includes a dishcloth pattern. Diamond Lattice Stitch – Salty Pearl Crochet. If you like a more lacy stitch for your dishcloth, this pattern will be great for you! Knit Looking Garter Stitch by A Crocheted Simplicity. 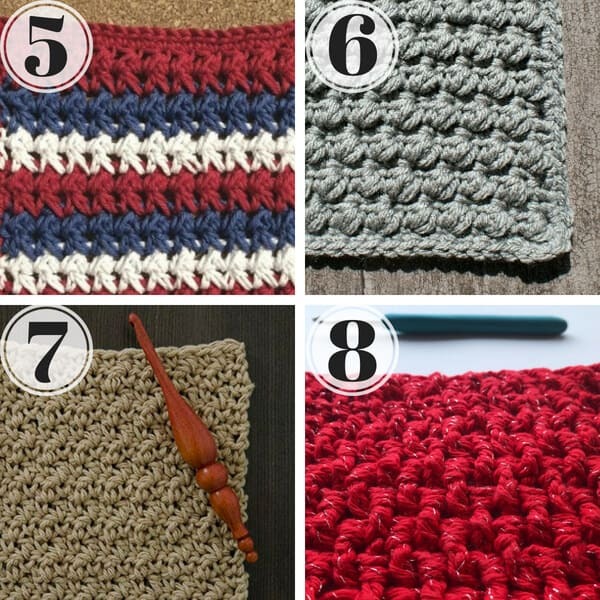 I haven’t met a crocheter who doesn’t like to imitate a knit look and this stitch guide includes a dishcloth pattern. Piggyback Stitch by Underground Crafter. The instructions for this stitch are for a 7″ by 9″ block but you could easily stop 2″ short to get a square. Suzette Stitch by Salty Pearl Crochet. This stitch tutorial includes a spa washcloth pattern. Isn’t it beautiful? Reversible Knit Looking Ribbing by A Crocheted Simplicity. The dishcloth pattern included is nice and thick for scrubbing. Grit Stitch by Crochet 365 Knit Too. 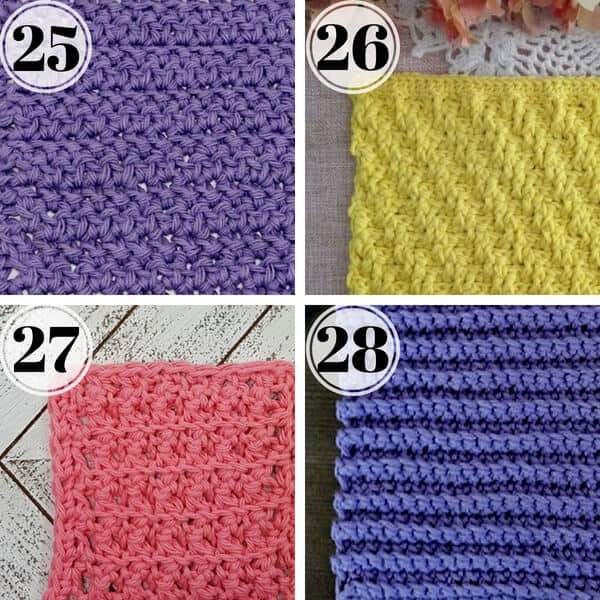 You can use the starting stitch count instructions to make your own perfectly sized dishcloth. Crossed Single Crochet by Oombawka Design. This post includes instructions for not just one but four different sizes! Textured Crochet Stitch by Mama in a Stitch. Textured crochet stitch, which may not be its official name, includes a washcloth pattern. Forked Half Double Crochet by The Stitchin’ Mommy. This is a stitch I have never seen before and the instructions include patterns for 3 different sizes. Herringbone Stitch by Oombawka Design. Instructions include a pattern for a dishcloth. Diagonal Raised Stitch by Crochet for You. 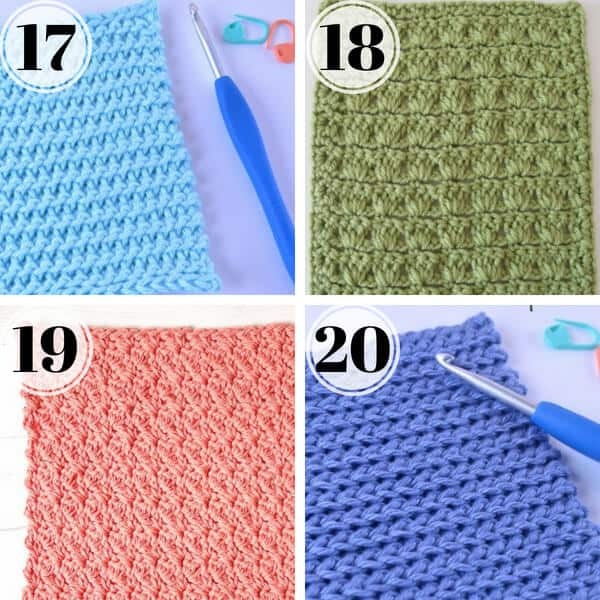 This tutorial walks you through the stitch while making the dishcloth. Single Crochet Cluster by Oombawka Design. Includes four different sized patterns for a dishcloth. Ribbed Single Crochet by The Stitchin’ Mommy. Imagine the scrubbing power of this one! Includes the dishcloth pattern. Bonus: the N stitch by Voth Designs – video tutorial on how to do this unique stitch, which would look lovely in a dishcloth. 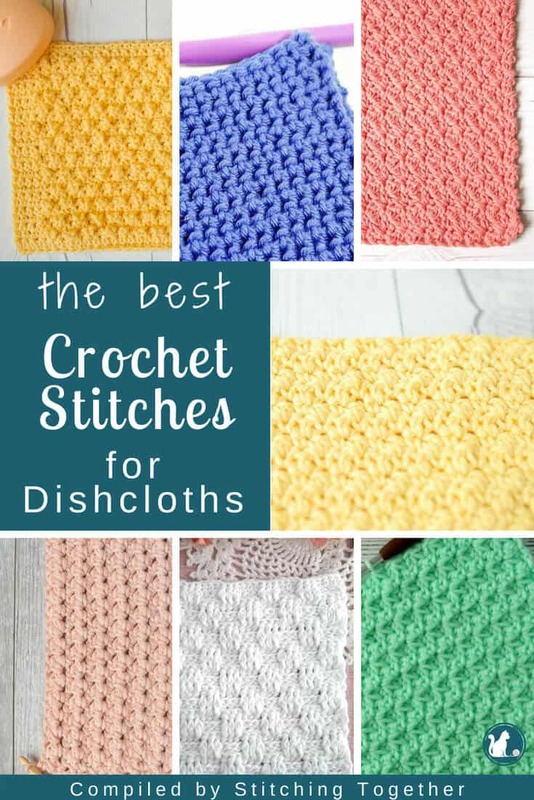 You don’t have to just use these crochet stitches for dishcloths or washcloths, although I do think that is a great way to learn them. So many of them would be beautiful in blankets or scarves. Once you start combining the different stitches, the possibilities are endless! Now that I have spent so much time staring at all of these gorgeous crochet stitches, I am itching to get some yarn in my hands. Where to start…. ?